medicine in the world today." STOP PRESS! - Homeopathy in Practice (HiP), the voice of practising homeopaths, is now published in FULL COLOUR! To celebrate, we have given HiP its very own website. 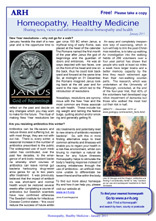 Click here to find out more about our super journal, and download a selection of articles for free! 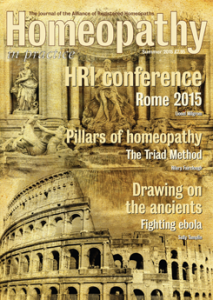 The Alliance of Registered Homeopaths produces a number of high-quality publications, most notably, our quarterly journal, Homeopathy in Practice (HiP). HiP is an exceptional publication for the homeopathy profession, in which we explore important issues, and keep readers up to date with the latest developments. Feature articles cover a range of topics which help to extend our knowledge and understanding of our unique and complex system of medicine. Some articles published in HiP are literally ground breaking! The Summer/Autumn 2014 issue features a fascinating account of the current work of Nobel Prize winner, Professor Luc Montagnier, entitled ‘Rediscovering the memory of water’. Professor Montagnier has revisited and further developed the work started by the renowned French scientist Jacques Benveniste. The theory of the ‘memory’ of water is regarded as controversial by some, because it states that water can reproduce the effects of a substance with which it has been in contact, even when there is no longer any trace of the substance in the water. Montagnier has devised a series of experiments which appear to support the ‘memory’ of water theory, and the article published in HiP explains the latest science behind this remarkable work. HiP is required reading for all those who want to keep in touch with the field of homeopathy today. said the late Julian Winston, Director Emeritus of the US National Center for Homeopathy, Co-director of the Wellington College of Homeopathy in New Zealand, and author of The Faces of Homoeopathy and The Heritage of Homoeopathic Literature. Click here to download a form and subscribe to HiP, a journal ahead of its time! Why not advertise your products, services, or forthcoming events in our profession specific journal? If you are not an ARH member, you can visit our Online Shop to subscribe and order back issues. 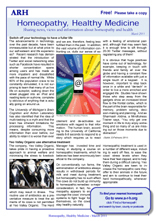 A publication aimed at sharing news, views and information about homeopathy and health. 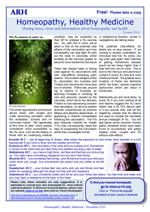 This newsletter for the public will be produced ten months of the year, and is intended to raise public awareness of the potential benefits of homeopathy. It is available as a free download by clicking here. 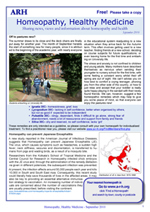 Click on a newsletter to view. The Alliance of Registered Homeopaths is committed to publishing high-quality books that advance our understanding of the theory and practice of homeopathy. Sure to appeal to homeopaths and their patients, practitioners of other complementary and orthodox therapies, physicists, chemists, biologists and all those interested in one of the big controversies in contemporary science. All our books are available for purchase at our Online Shop. 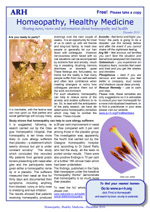 Back issues of Homeopathy in Practice and are available via our Online Shop.